A soldier of Custer’s regiment uses his Springfield carbine as a club. Source of this painting is not known. When you grow up in desert heat, at least when video games and television have yet to proliferate, one of the joys of childhood is playing with the garden hose. Personally, I enjoyed digging rivers and lakes into the earth of the wire enclosure where our chickens roamed. I remember the amazement of unearthing a living frog that had burrowed into the ground for hibernation, and that had narrowly avoided the blade of my shovel. One of my maxims about the desert landscape around Saddle Mountain is that this earth is honest. When people pass through, the traces they make remain to be read by those who come after them. As I think back on the traces we’ve discovered on our farm alone, it amazes me that so much history is written in its sand and dust. In the early 1960s my father hooked his tractor to a battered old machine he called the rototiller. He was in the process of rooting sagebrush out of a new field, and this machine would completely destroy the plants that grew there naturally. I don’t think anybody considered how many other living things were destroyed in a process like this: human efforts had priority over ecosystems. I remember my father coming home for lunch that day and as we ate our toasted cheese and Campbell’s tomato soup he pulled a dull red arrowhead out of the pocket of his striped overalls and laid it on the table. (In those days anything with a point on it was called an arrowhead, unless it was big enough to qualify as a spear point.) The beaters of the rototiller had flung it at him, missing by a few inches. He found it on the metal corrugated floor of the old Oliver next to his seat. Later I followed the story of this artifact in a fanciful reconstruction. This gentle grassy slope is the site of the Walt Danielson farm on the verge of irrigation in the early 1950s. The two coulees are visible at the center of the distant plateau. Somewhere back in the dusty past a Native American hunter crept quietly through chest-high bunchgrass that carpeted the slope before the white man’s livestock ate it nearly all up. At the top of a rise are two coulees cleft into the plateau, a perfect place to find game: shelter and perhaps some water might be found there. But something exploded out of the brush. Was it a badger, a jackrabbit, a lynx or a coyote? Maybe even a deer. Whatever it was, quick as the wind the hunter launched his shaft (Dart from an atlatl? Arrow?) The first shot misses and the shaft disappears in the brush, lost now from human sight until a rototiller launches its point once again at my father’s back. Just when this hunt took place I cannot say. Projectile point charts show one variety of point called the Merrybelle Side Notch, dating from between 2,500-1,750 years ago and looking very similar to the red point my father dodged. It wasn’t the last weapon to get lost in the weeds on our farm. It wasn’t uncommon for hunters to stop in at our farm to ask permission to look for pheasants or ducks. 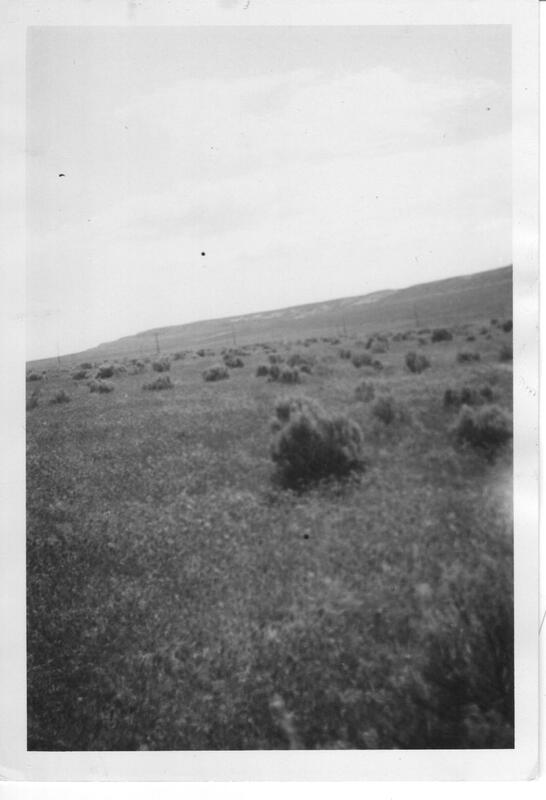 If he had livestock grazing in the pastures around the house, my dad would often send the hunters into the rills below the coulees where there were several acres of undeveloped land. In a remarkable gesture of honesty sometime around 1960, a hunter returned to the farmhouse and handed over to my father a gritty old rifle he’d found in the weeds. Screw holes and a streak on the stock where fabric tape once repaired a crack can be seen in the foreground. Reflected light highlights the octagonal barrel replacing the original round one. My brothers and I enjoyed playing with this rifle, a model 1873 U. S. Springfield, a trapdoor 45-70. If my memory is accurate we even fired the thing once, but if we did we had to have been crazy. Young men often are. The rifle was in terrible shape. It had rested in the sun and sand for decades, and even before it was lost it had been battered and mended many times. Cracks in the stock were taped, stapled, screwed and nailed together and there was a tiny crack on the edge of the hammer. It looked like someone used it as a club and then mended the damage with whatever they had on hand. All the same, the gun had character. When I was away at college I returned to the farm in Othello to discover that my father had taken the Springfield to a gunsmith to have it cleaned up. To my dismay the gunsmith had removed all the old fabric tape, many of the screws and nails and other fixes the previous owner had made. He glued the crack up tight and slathered a thick, smooth mahogany varnish over the old stock. The character of the gun was changed completely. I grew up believing that the Springfield was an original cavalry carbine, and it was not until I began researching it in the 1990s that I realized that the heavy octagonal barrel it had was a replacement for an original round barrel. Who knows where the original barrel went, or why it was replaced? Or where the replacement barrel came from? I realized then that this gun could tell a very complex story. 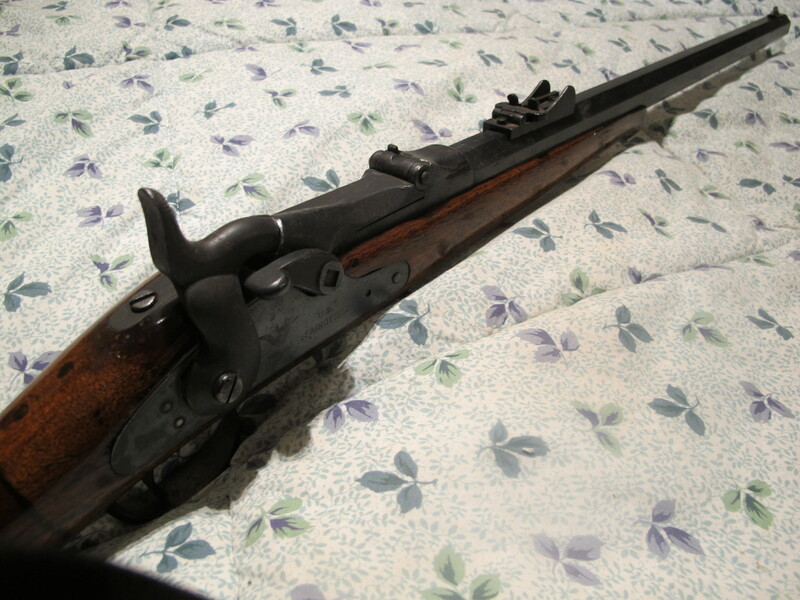 Even more so, when I researched the serial number on its breech and discovered that it falls within the Custer range. 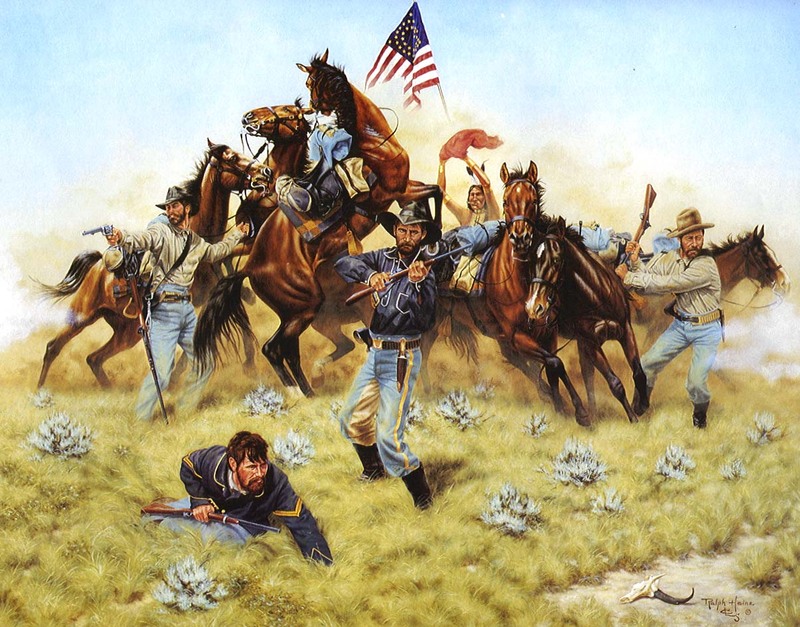 Custer’s men had been issued Springfields before their fatal battle in 1876. Any of the rifles stamped 00001 through around 50,000 could potentially have gone to victorious Native Americans at the Little Big Horn. Our gun was stamped 1246. With its violent history, and considering the fact that it ended up in the sands of land occupied by some of the last free-roaming Native Americans, it seems quite likely that one of Custer’s doomed soldiers once used this weapon. Maybe that’s what caused the magnificent crack in the stock. Then again, there are some 57,000 guns in the Custer range. But let’s go back to that chicken pen where I found the hibernating frog. Around the same time my brother Ron uncovered a pair of wonderful artifacts in the same pen. One was a Chinese coin, brass with a square hole in the middle and intriguing characters molded around it. The other was a small bronze incense burner, a three-legged pot incised with curious faces on the legs and with little decorative plaques welded to the sides. Clearly there had been a camp of Chinese workers on this spot when the railroad was being built. Considering the many interesting finds our family made on our own property as we were growing up, you might think we lived on a treasure trove. But I think plenty of land in that area is just as fertile with the relics of all the ages of humankind that lived in our region. Even more so, if you think about that cache of Clovis points discovered at East Wenatchee in an irrigation ditch. The history of human occupation of our land is written in the earth. This entry was posted in Art, Columbia Basin, Conflicts, Crab Creek, Death, Education, Family History, History, Native Americans, Railroads, Saddle Mountain, Speculative History, Treasure, Washington and tagged Arrowheads, Art, Atlatl, Badger, Bunchgrass, Campbell's soup, Central Washington, Chickens, Chinese workers, Clovis points, Coin, College, Culture, Deer, Desert, Ducks, East Wenatchee, Eastern Washington, Ecosystems, Education, Environment, Family History, Farm, Frogs, Garden hose, George Armstrong Custer, Gunsmith, Hibernation, History, Hunters, Irrigation, Jackrabbit, Little Big Horn, Livestock, Lynx, Merrybelle, Milwaukee Road, Native Americans, Nature, Oliver tractor, Othello, Pheasants, Projectile points, Railroads, Rototiller, Saddle Mountain, Sagebrush, Soldiers, Springfield carbine, Television, Tractor, Treasure, U.S. Springfield trapdoor, Video games, Walt Danielson, Washington, Weapons. Bookmark the permalink.